The Signature Hires initiative is designed to advance the University’s educational initiatives. The additions will involve a combination of signature hires and cluster hires seeking to build a more diverse faculty, elevate the University’s national and international reputation in signature areas and enhance interdisciplinary collaboration through cluster hires. To initiate the signature hiring process, each school and college was asked, if given the opportunity, how they would distinguish themselves through signature hires. For example, one school noted in its signature hire proposal the desire to build a critical mass of faculty able to generate high-impact intellectual capital in key areas, such as entrepreneurship, to better distinguish the school among its peers. Recommended signature positions were reviewed by a panel of senior faculty and campus leadership. 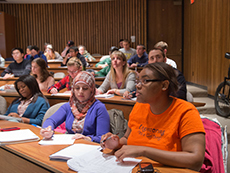 Criteria for signature hires included a requirement to increase the quality of education at Syracuse University by a combined commitment to teaching and research. The initiative seeks to identify a diverse group of talented and passionate educators whose expertise in their research fields will enable them to translate their success into practical, real-world action by their students and prepare those students for careers that address contemporary issues. Using that criteria, the Signature Hires Initiative review panel identified 31 positions across the 11 degree-granting schools and colleges, with positions to be cost-shared by the University and the schools and colleges. Under the Signature Hires Initiative, identified signature hires should contribute to the national and international reputation of Syracuse University, bolstering the earning power of graduating students and enhancing institutional success in recruiting new students. Invest Syracuse: Advancing Academic Excellence and the Student Experience aims to provide all students with a distinctive, world-class learning experience that prepares them for professional and personal success. The three-pronged initiative seeks to redefine the student experience, advance discovery and innovation and expand opportunity for students of promise and talent from across the socioeconomic spectrum. To learn more about Invest Syracuse, visit http://investsyracuse.syr.edu.